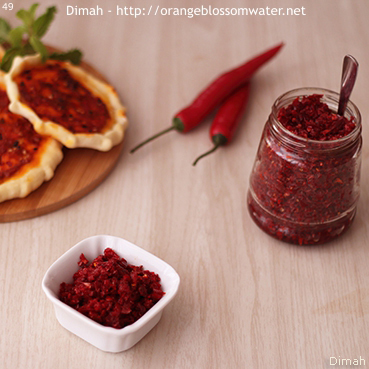 Dibs Al-Fleifleh Al-Halabiyeh is red pepper paste made from Aleppo Pepper (a variety of Capsicum annuum). It is prepared in summer (July and August). Dibs Al-Fleifleh Al-Halabiyeh is widely used in Syrian Cuisine especially in Aleppo. it is used in many recipes such as Manaqish as you see in the picture, Kibbeh Naiyeh Bi-Zeit Az-Zeitoun, Itch, Bathenjan Mshattah, Mhammara, Lahm Bi-‘Ajin, and others. 1, 2. Bring red chili peppers. 3, 4, 5. 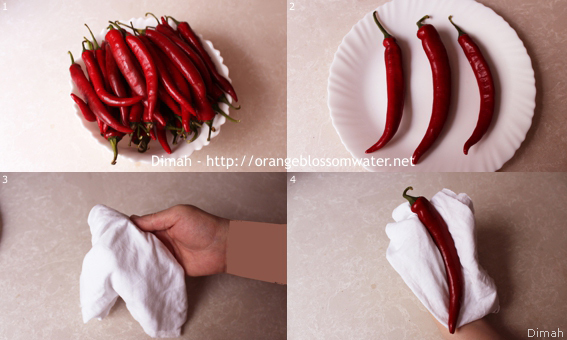 Wipe chilies with a dry cloth to clean. 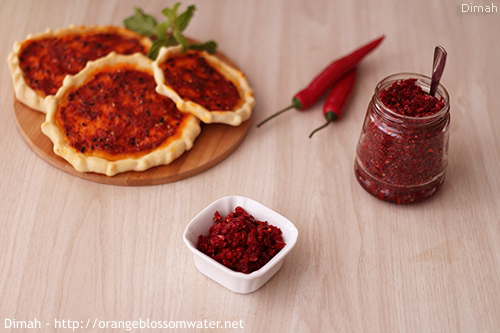 Do not rinse or wash the chilies. 6, 7, 8. Cut off and discard the end piece with the stem attached. 9. Slice chili in half lengthwise. 7, 8, 9, 10, 11, 12. Run the knife under the vein/rib in the centre of the halved chili and remove that along with the seeds. Throw the seeds away. 13. Line a tray with a clean cotton cloth. 14, 15, 16. 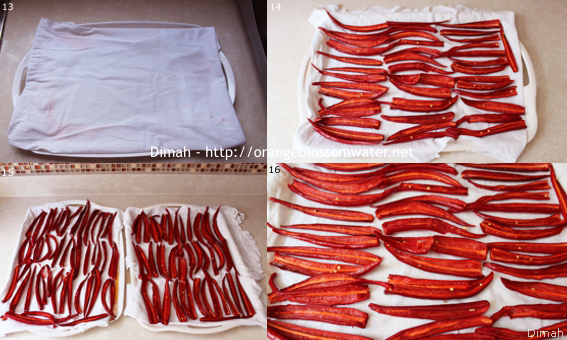 Arrange the chilies cut-side up in a single layer on the lined tray. First Day: I put the trays in front of a fan for the whole day “at night I turned off the fan”. Second Day: In the morning, I left the trays in the sun for two hours “after these two hours, sun was no longer shone on my balcony”, so I returned the trays inside and put them in front of the fan for the rest of the day “at night I turned off the fan”. If you will dry the chilies in front of the fan so two days are enough, but if you will leave them in sun so that may need one day or two days, it depends on the strength of the sun. 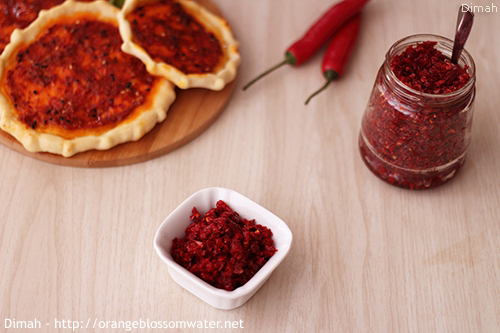 The result should be semi-dried chilies, which means contain some moisture. 21, 22. 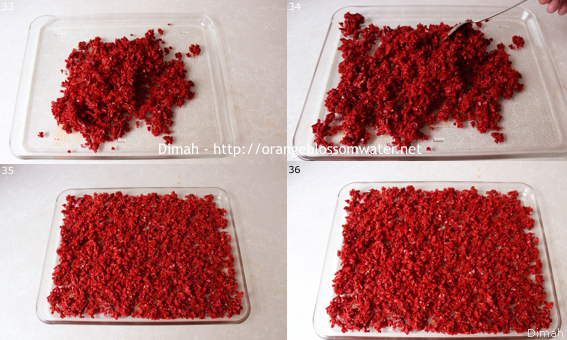 When process of drying is finished, bring semi-dried chilies. 23, 24. Attach the medium holed plate to the meat grinder. 25, 26, 27, 28, 29, 30, 31. 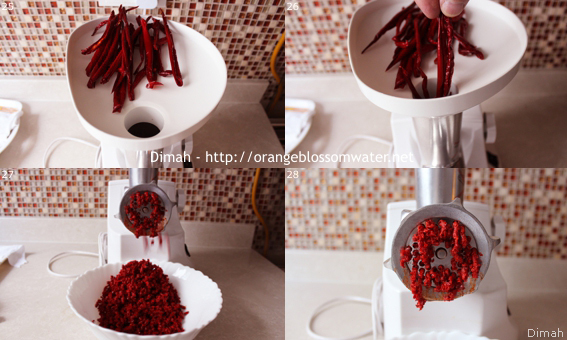 Grind the semi-dried chilies. 32. 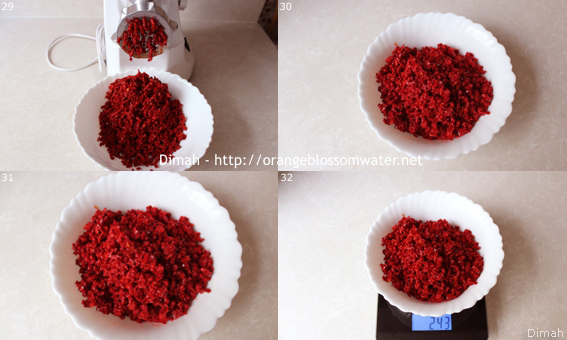 The weight of the chilies after drying and grinding is 243 g.
33, 34, 35, 36. Spread chilies evenly on a tray. 37, 38, 39, 40, 41, 42. Add 15 g coarse salt to the chilies and mix. 15 g salt is enough for this quantity. 43, 44. 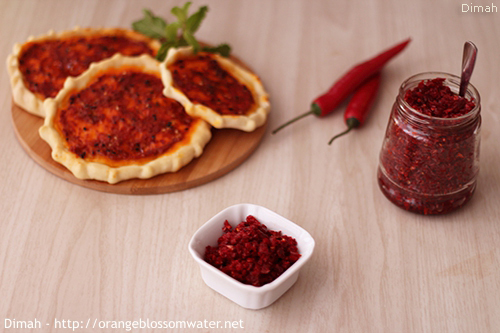 Drizzle chilies with olive oil (2 – 3 tablespoons) and mix. 45, 46, 47, 48. Put chilies in jar, cover with olive oil and seal. Store in the refrigerator. 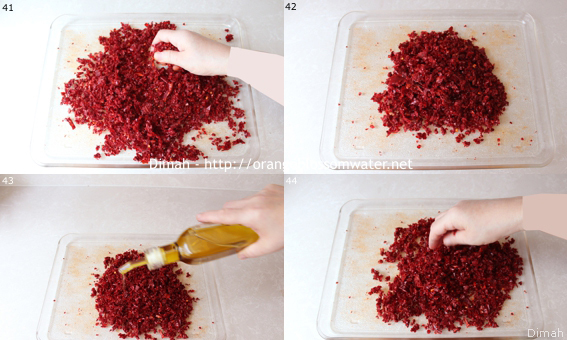 Or after adding salt to ground chilies (steps 37 – 42), store in a plastic bag in the freezer, no need to add olive oil to it. 49. Dibs Al-Fleifleh Al-Halabiyeh is widely used in Syrian Cuisine especially in Aleppo. It is used in many recipes such as Manaqish as you see in the picture, Kibbeh Naiyeh Bi-Zeit Az-Zeitoun, Itch, Bathenjan Mshattah, Mhammara, Lahm Bi-‘Ajin, and others. 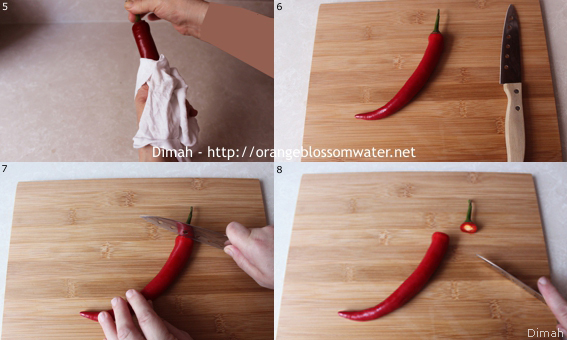 Wipe chilies with a dry cloth to clean. 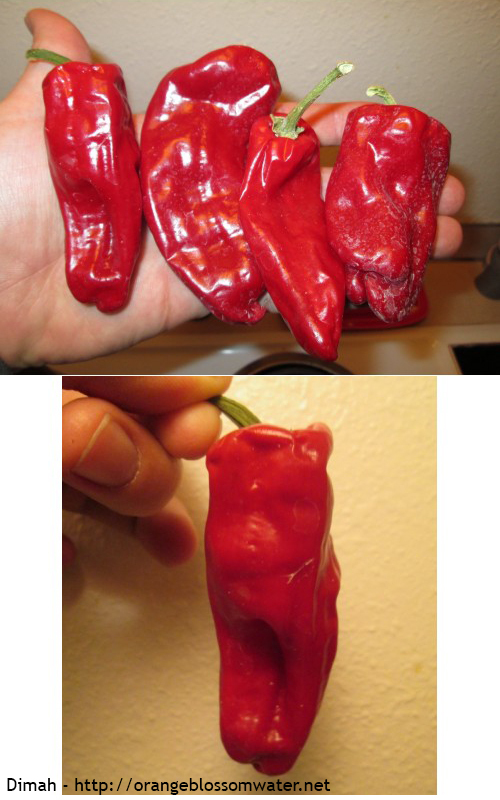 Do not rinse or wash the chilies. Cut off and discard the end piece with the stem attached. Slice chili in half lengthwise. Run the knife under the vein/rib in the centre of the halved chili and remove that along with the seeds. Throw the seeds away. Line a tray with clean cotton cloth. 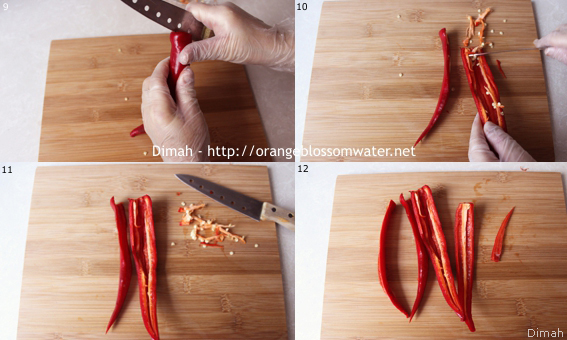 Arrange the chilies cut-side up in a single layer on the lined tray. 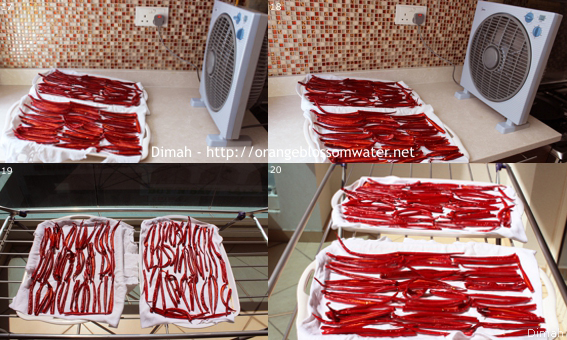 When process of drying is finished, bring semi-dried chilies. Attach the medium holed plate to the meat grinder. 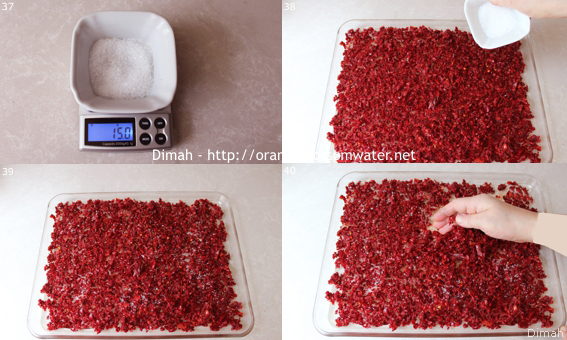 The weight of the chilies after drying and grinding is 243 g.
Spread chilies evenly on a tray. Add 15 g coarse salt to the chilies and mix. 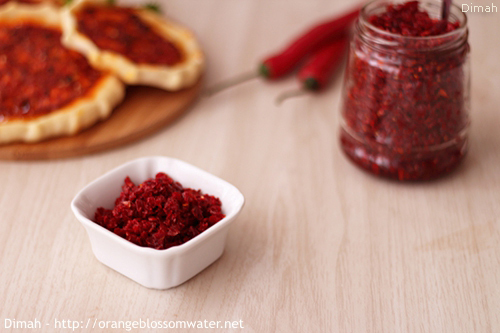 Drizzle chilies with olive oil (2 – 3 tablespoons) and mix. 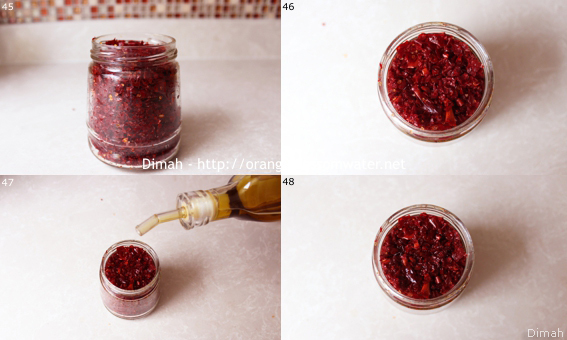 Put chilies in jar, cover with olive oil and seal. Store in the refrigerator. Dibs Al-Fleifleh Al-Halabiyeh is widely used in Aleppine recipes like Manaqish as you see in the picture, Kibbeh Naiyeh Bi-Zeit Az-Zeitoun, Itch, Bathenjan Mshattah, Mhammara, Lahm Bi-‘Ajin, and others. 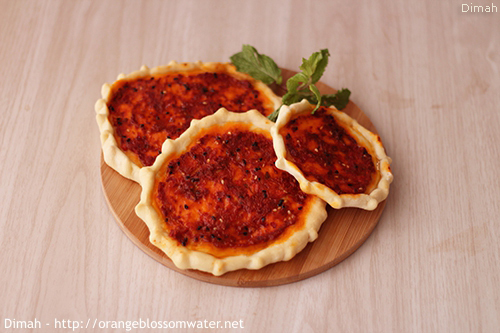 In Aleppo, Dibs Al-Fleifleh Al-Halabiyeh is usually made from Aleppo Pepper (a variety of Capsicum annuum). But I only had red chili peppers so I used that. 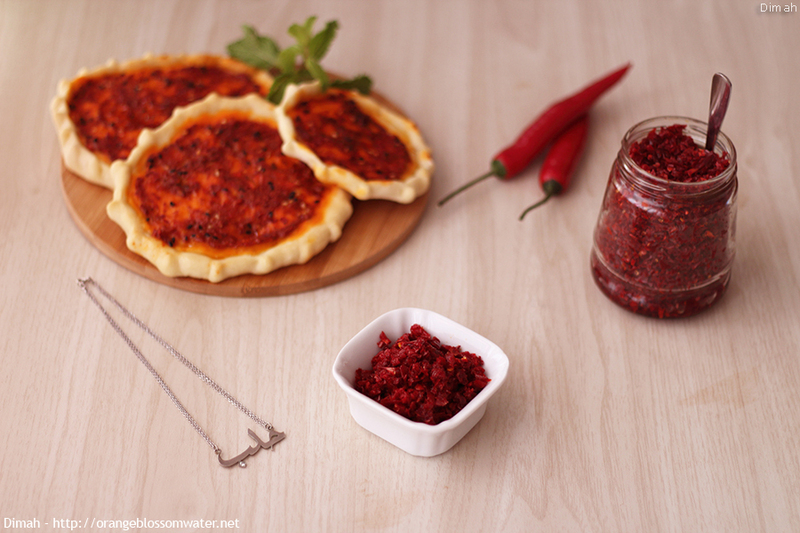 Dibs Al-Fleifleh Al-Halabiye can be made from sweet, mild, or hot peppers. In recipes, I usually use a mixture of sweet Dibs Al-Fleifleh and hot Dibs Al-Fleifleh. 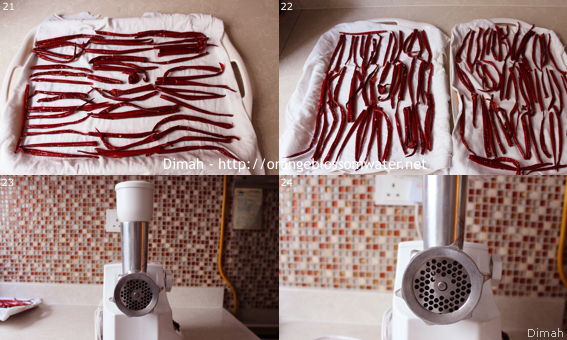 If the climate in your country like Syria, so make Dibs Al-Fleifleh by drying in sun because this is the right way and the result is tastier. 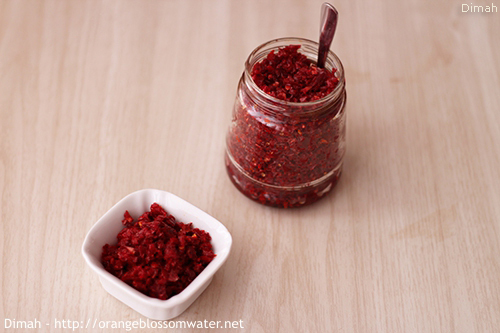 so spread ground chilies evenly on a tray and put in front of the fan for one day, toss every once in a while, then add coarse salt and store as directed in the recipe, click here to see this step. Or if possible leave the tray in sun, but cover ground chilies with a cotton cloth and leave in sun for one day, toss every once in a while, then add coarse salt and store as directed in the recipe, click here to see this step. This entry was posted on Tuesday, May 31st, 2016 at 10:25 PM	and is filed under Syrian Ingredients, To Aleppo With Love. You can follow any responses to this entry through the RSS 2.0 feed. You can skip to the end and leave a response. Pinging is currently not allowed. Waow, aie dadeh bidad !